Applique makes up a sizable percentage of my work. I enjoy its process (choosing ready-made designs or creating my own, auditioning fabrics for each piece, preparing templates or not, cutting the pieces, fusing them or using the needle turn method...), and I gravitate to it often, particularly when stressed, as its steps take my mind off everything else around me. 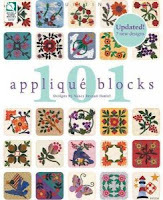 Last night I got this book, 101 Applique' Blocks by Nancy Brenan Daniel (I found it here). The variety of blocks appealed to me... The designs lend themselves to cotton or wool fabrics, and many can even be used for embroidery work. Nancy prefaces the design section with General Instructions covering terms definition, instructions on how to applique the blocks, fabric selection, etc. Then, each design is presented in an easy to copy format. The Special Notes on each page mention details specific to that page's design, such as when to reverse a particular piece. Overall, a great purchase! 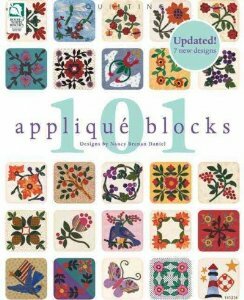 For those times when you are stuck wanting to applique something but with no idea for blocks, this is a perfect go-to resource. FELICIDADES HOJE E SEMPRE,PARA CADA DIA DE SUA VIDA E DE SEUS FAMILIARES. BeijoGRANNNNDE>Hoje 20 de março é o DIA INTERNACIONAL DA FELICIDADE. Mas também pode ser comemorado do dia 1 de janeiro a 31 de dezembro de todos os anos.